Best air quality – best concentration – best conference / meeting and school results! The CO2 Display from Rotronic ensures an ideal feel-good environment in conference, meeting rooms, public areas and classrooms thereby ensuring the highest performance by the participants. 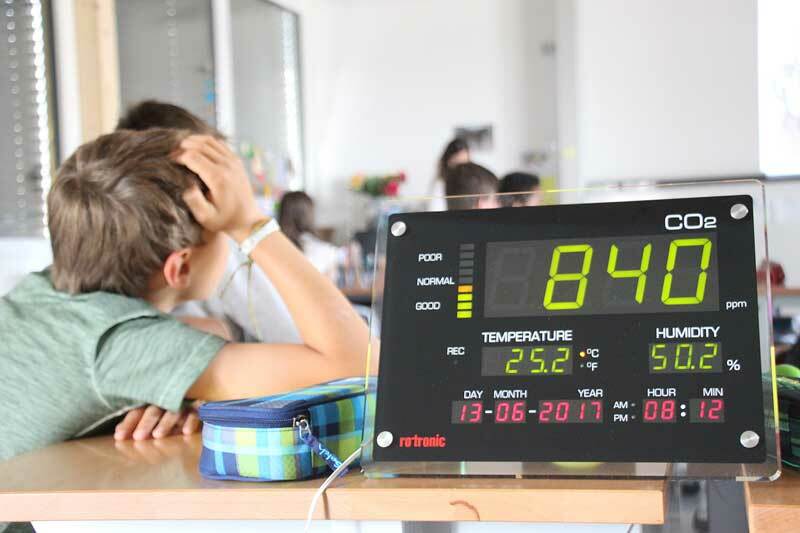 The CO2 Display has been installed in Swiss schools as part of a large-scale project to measure indoor air in classrooms. Participants’ concentration and performance levels in meetings or school and college lessons depends directly on the quality of air in the rooms. With many people present in a room where there is too little oxygen and too much CO2, the people soon find it hard to concentrate or stay awake. In a closed room, 25 to 35 cubic meters of fresh air per person per hour are needed, given normal activities. If this is replenished, the carbon dioxide values (CO2) levels stay under the critical limit of about 1,000 ppm (ppm = parts per million of carbon dioxide in air). At the same time, the volatile substances exuded by humans are largely extracted to a sufficient extent. Unfortunately, without the introduction of fresh air and the use of a CO2 indicator the air becomes stale quite quickly, by the time we realise productivity and individuals alertness has already dropped markedly. A CO2 sensor with a visual alert on the large display from Rotronic is definitely the answer in this situation. The inexpensive CO2 Display evaluates the air quality with the combined measurement of CO2, humidity and temperature. It responds quickly and reliably as soon as the CO2 level in a room is too high and action needs to be taken. This could simply involve the opening of windows for fresh air ventilation or by switching on a ventilation system. The instrument, which can be used as wall-mounted or bench-top display, can be configured directly and easily with buttons, stored data can be exported to a USB stick for analysis with the freely available Rotronic PC software package SW21. Thanks to the CO2 Display, Rotronic customers have quickly found that a good room climate positively nfluences work performance and wellbeing: for Alfred Freitag, Sales Manager for Switzerland at Belimo Automation AG, it is clear that a meeting should be halted and the room ventilated when the CO2 concentration reaches 1,200 ppm, or earlier. Martin Bänninger, Chief Executive Officer of the Swiss Association for Air and Water Hygiene, also recommends the use of the Rotronic display as it measures CO2, air humidity and temperature reliably and clearly visualizes when action needs to be taken to improve the quality of the air. The CO2 Display from Rotronic can quickly visualize measured values such as temperature, humidity and CO2 which is good indicator of air quality in a room. The compact instrument is easy to use and displays the data without complication. The CO2 Display can be used as wall-mounted or bench-top device and is good value for money. Recorded data can be analysed by downloading on to a USB memory stick with subsequent evaluation using the free Rotronic PC software package SW21.